Our generous donors have enabled St. Mary Medical Center to provide quality medical care to the Long Beach community regardless of their ability to pay. 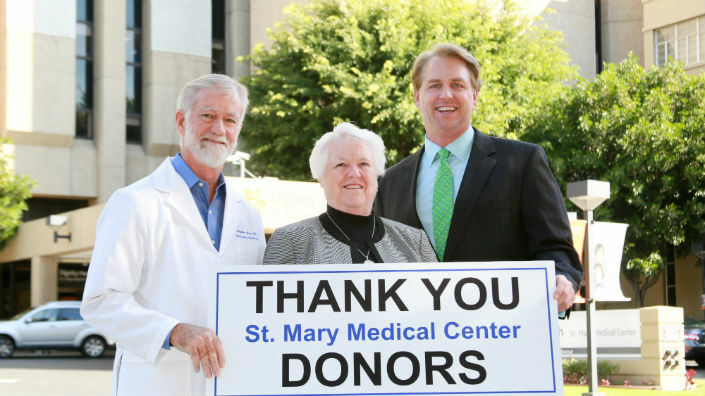 When you make a gift to the Foundation you truly make a difference in the lives of the patients and their families at St. Mary Medical Center. One hundred percent of your gift will go directly to the medical center in support of programs and services. You can support the mission of St. Mary Medical Center and the Sisters of Charity of the Incarnate Word with your generous donation. By phone: Call the St. Mary Foundation office at 562-491-9225. Monday –Friday, 8am-5pm. Website: Please click on the Donate Online Link and you will be directed to our online giving form. Securities or Real Property: The St. Mary Foundation accepts gifts of securities and real property. Please contact the Foundation Office at 562-491-9225 to make a gift of appreciated securities, mutual funds and other properties. Matching Gifts: If you work for a company that has a matching gift program, you may double your gift. We encourage you to check with your company to see if the matching program is available.